Congratulations to the winners of the last contest. The autographed copies of Rosemary Harris' Pushing Up Daisies will go to Kelly G. from Gastonia, NC and Phyllis G. from Cheyenne, WY. Dan Waddell's The Blood Detective will go to Margie B. of San Jose, CA. The books will go out in the mail tomorrow. Maisie Dobbs or Stephanie Plum? A few of us might read mysteries about both characters, but the books featuring them are very different. 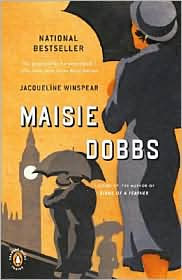 I have an autographed paperback copy of Jacqueline Winspear's Maisie Dobbs. This novel won the Agatha for Best First Novel when it came out, and was a finalist for the Edgar and Anthony Awards. It's the book that introduces Maisie Dobbs, a young woman, returned from WWI, now opening her own detective agency. These mysteries are fascinating, with the background of post-war England. 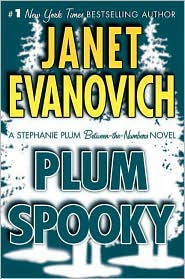 There's nothing serious about the latest Janet Evanovich novel, Plum Spooky. This fun Stephanie Plum story is the best of the recent books in the series. I have an ARC of the enjoyable book. How can you miss Stephanie Plum and a monkey? So, would you like to win Maisie or Stephanie? If you'd like to win one, email me at Email me!. If that link doesn't work for you, the email address is: lholstine@yahoo.com. Your subject line should read either Win "Maisie" or Win "Stephanie". Your message should include your mailing address. Entrants only in the U.S., please. The contest will end Thursday, March 12 at 6 p.m. PT. Jim will draw the winners at that time. The winners will be notified, and the books will go out in the mail on Friday. Good luck! Thanks for your note to the winners, Serena! They both sound great but I'm picking Maisie. Dree, you can put your name in for both books. Just send your name and mailing address to me at lholstine@yahoo.com. You don't have to pick just one of the two! Thanks, John. Please send your name and mailing address to me at lholstine@yahoo.com. Thanks, and good luck! You always have the best books for giveaway! Thanks! Happy spring to you & yours!